The Volkswagen Beetle is one of the most iconic shapes in the automobile world. Almost no other car has stuck to a design philosophy so hard through the decades,with the exception of the Porsche 911. And where did Ferdinand Porsche take his inspiration from again? A Volkswagen Beetle, no matter what century it belongs to, has to be influenced by the original, the retro theme being the only reason it exists in the modern world. After all, under the iconic body work is a very modern and rather straightforward Volkswagen Jetta. With the 21st century Beetle, Volkswagen aimed at toughening up the looks a bit. Of course, it's unmistakably a Beetle but the car sits a bit lower and wider than before. The face is characterised by the round bi-xenon headlamps with daytime running lamps. The Beetle's roof looks a bit flatter than before and I also like what the company has done with the rear end, and that big spoiler looks good over the new stretched out tail lamps. The wheels are 16-inchers and are wrapped in 215/60 R16. The Beetle looks good with these wheels and I don't think it need excessively large rims. The high profile tyres have an added bonus of improving ride quality as well. It's only when you walk up close do you realise just how flared out the wheel arches are - they're huge and make the Beetle 30mm wider than a Jetta. Frameless windows add some class but I do feel that those chrome mirror caps look out of place and way too shiny. 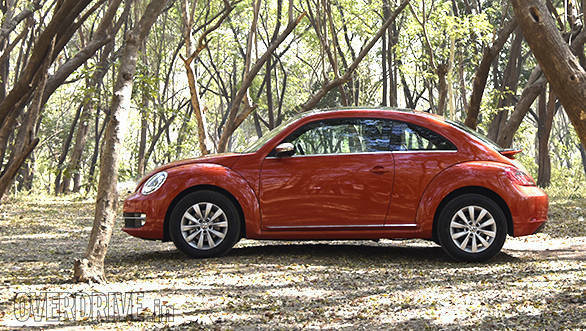 The Beetle is quite long too, about as much as a Hyundai Creta but the design masks its size well. The Beetle looks quite compact and that feeling continues behind the wheel as well. 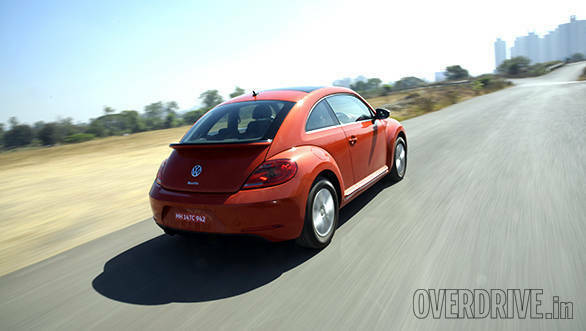 Despite having debuted internationally in 2011, the latest Volkswagen Beetle looks fresh and appealing. The same applies to the cheerful cabin that's brightened up by the exterior colour themed dashboard. The effect is well carried out and makes the cabin feel unique. 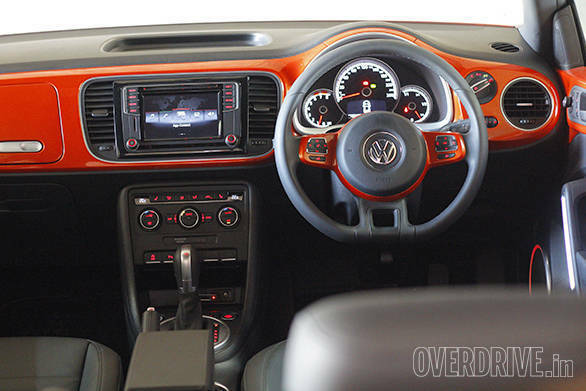 Beyond that, this is a staple Volkswagen cabin with familiar and high quality feeling buttons, knobs and gear shift lever shared with the Polo/Vento and Jetta. There's a crisp touchscreen display which supports USB and aux input, making it quite versatile. The door pockets have elastic bands on top to increase storage capacity but the bottom isn't wide enough to hold a water bottle; that seems to be a feature found solely in cars built for India. There's also enough space in the dash and centre console to hold a mobile phone, wallet and a couple of cups. The Beetle gets a large panoramic sunroof but it only opens halfway, which should hopefully deter passengers from sticking their heads out. The rear bench can accommodate a six footer for short distances and will be fairly comfortable for a couple of short passengers or kids. 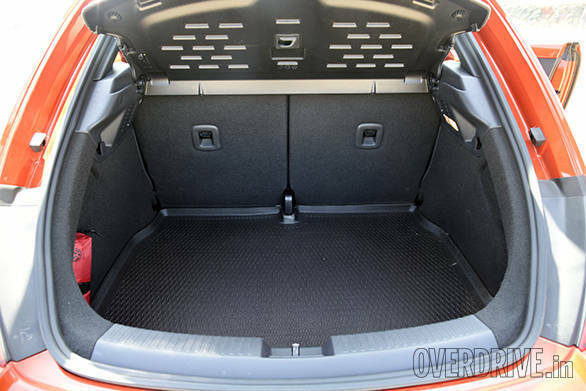 The boot is really spacious too with 310 litres although the sloping tailgate limits capacity for tall luggage at the front. All told, the Beetle is quite practical. There's only one variant on offer and Volkswagen has thrown a huge number of features at it. Auto headlamps, cruise control, dual zone climate control, ESP, hill hold, ABS, 6 airbags, keyless entry and push button start, start-stop, even leather seats. Whether it's luxury or safety, the Beetle has all bases covered. Finally, Volkswagen brings to India the 1.4-TSI petrol the Jetta always deserved. 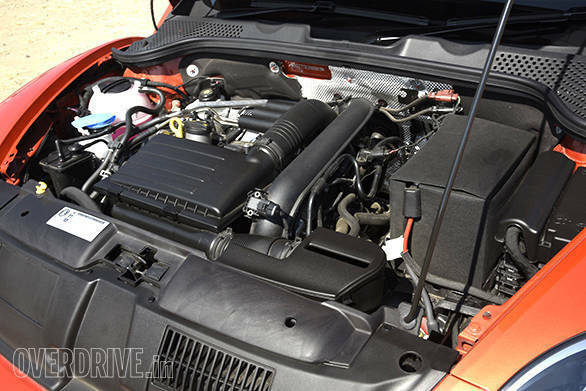 The Jetta gets the same motor but in a lower state of tune, producing 122PS and 200Nm. For the Beetle, power has been boosted to 150PS and 250Nm, all the juice the Beetle could need. It's very smooth on start-up and idles so quietly you can barely hear it. The sensation of refinement is prevalent at all speeds. The smooth engine and excellent NVH characteristics do such a good job of masking you from the outside world that the Beetle actually feels slow till you glance at the speedo. 150kmph comes up effortlessly and the Beetle pulls till just over 200kmph on the speedo. The 7-speed DSG gearbox comes with paddle shifters and offers quick and crisp shifts in Sport mode. Just like the Polo GT, it refuses to let you build revs and the only way to launch the car is with the revs at idle. 0-100kmph took 9.6s and would have undoubtedly been quicker had the gearbox allowed a more aggressive launch. Also similar to the Polo GT is the way this engine consumes fuel. Drive it with patience and a light right foot and it can be quite efficient. We got 17.1kmpl on the highway, a great number that's aided by the Beetle's coast function which drops revs to idle when you lift off the throttle at highway speeds. Get back on the throttle and the gearbox quickly re-engages, accelerating the car forward. However, if you start driving the car hard, the number drops significantly - we saw as low as 6.3kmpl. 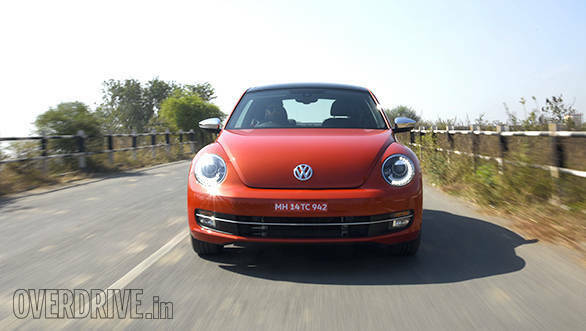 For Rs 28.73 lakh ex-Mumbai, the Beetle is anything but what the original set out to be, a people's car. While the first Beetle was designed for the masses and was one of the highest selling cars of its time this one goes down a very different path, as a modern and far more expensive descendant. It's a lot of money, but the Beetle is quite the comprehensive package, one that goes beyond just its brand image. It's reasonably spacious, very comfortable and has a fat features list. Even with the new makeover it's still a very pretty and feminine design, something that will be loved by its essential target audience. But beyond the looks they'll also enjoy how easy it is to drive and live with. Like its predecessor, this car will only be bought by folks looking to buy a Beetle. Post purchase, those customers will discover an excellent car lurking below the aura of the Beetle's identity.